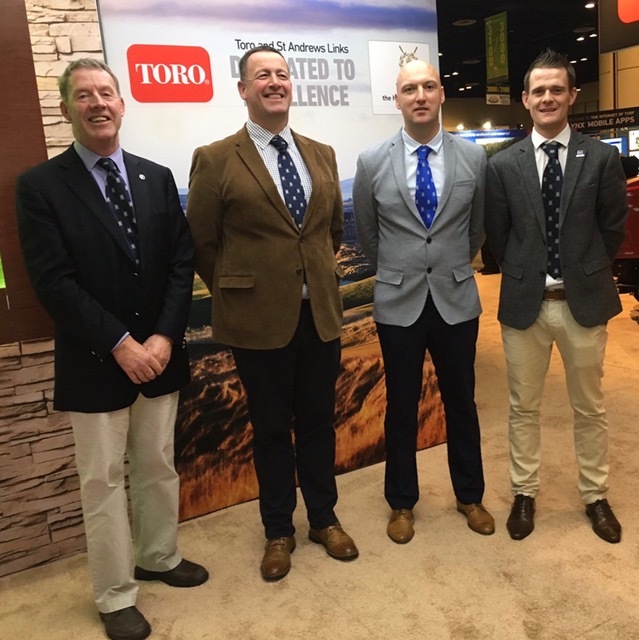 At the start of February (from left to right in image below) Gordon Moir (Director of Greenkeeping), Gordon Mckie (Course Manager, Old Course), myself and Craig Berry (Course Supervisor – Eden, Strathtyrum & Balgove Courses) attended the Golf Industry Show at the Orange County Convention Centre in Orlando, Florida. What is the GIS Show? This is an annual event presented by GCSAA (Golf Course Superintendents Association) and NGCOA (National Golf Course Owners Association). 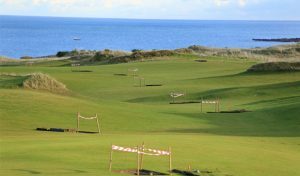 The four day event consists of an education conference and a trade show which is designed for and attracts a variety of different people within the industry from all over the world including golf course managers, assistants, interns, course mechanics, club mangers, CEOs and course architects. Over the years, the host venues have moved down from the northern states to the sunny southern state cities (no bad thing! ), alternating now between this year’s host Orlando (FL), San Antonio (TX) and San Diego (CA). The show’s schedule started with the education conference which ran from Monday 6th to Thursday 9th and the trade show which was on the Wednesday and Thursday. This is a four day education programme that consists of workshops, seminars and field trips. 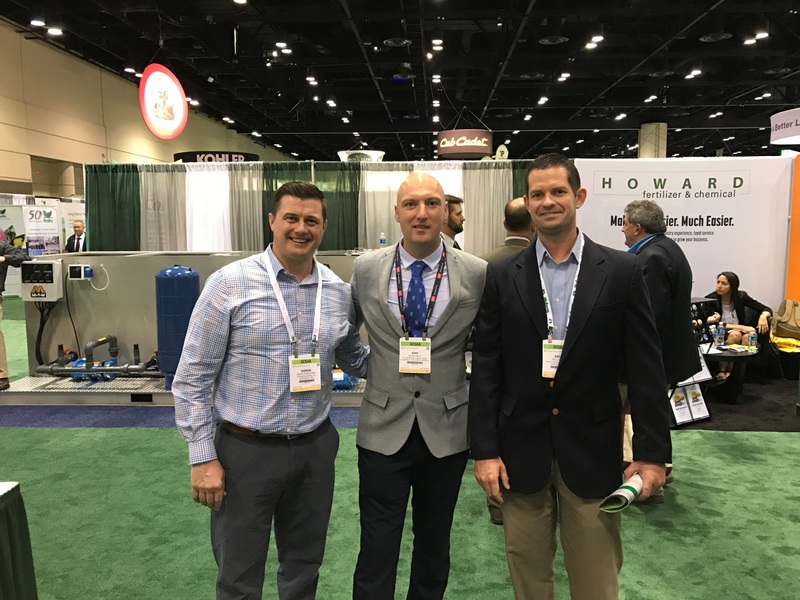 Organised by the GCSAA, it is the largest education event in the industry. This year there were 5,800 attendees, over 90 seminars and more than 425 hours of education. On Monday and Tuesday we all attended a number of different seminars between us. 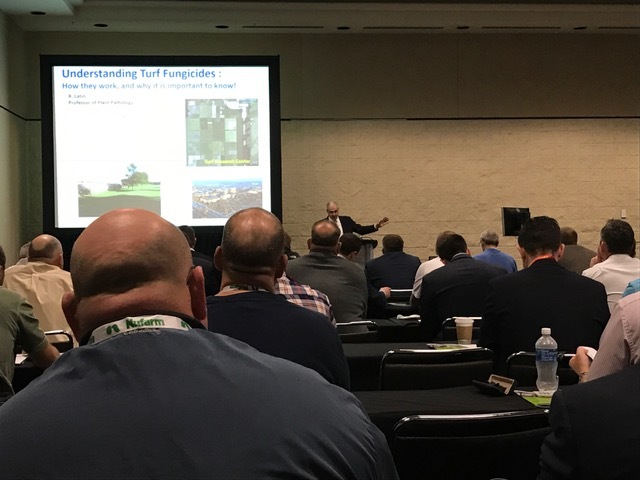 I attended “Understanding Turf Fungicides” – learning all about fungicide classifications and how the plant reacts. What you learn at these seminars is obviously very niche, for example this one was all about the different functions of certain fungicides and how they move within the plant were discussed as well as factors that influence fungicide performance… There’s more to greenkeeping than just cutting grass! Whilst there, we’re obviously representing St Andrews Links and it’s an opportunity to convey our values when meeting with customers and industry reps. A seminar I found particularly inspirational was “Key Interviewing & First Impression Strategies”. This was presented by Laura Katen, one of the world’s top career experts, and involved a lot of class participation. Apparently, we have an average of seven seconds to make a good first impression, so Laura coached us in fine tuning the perfect handshake and managing our professional image and conduct. 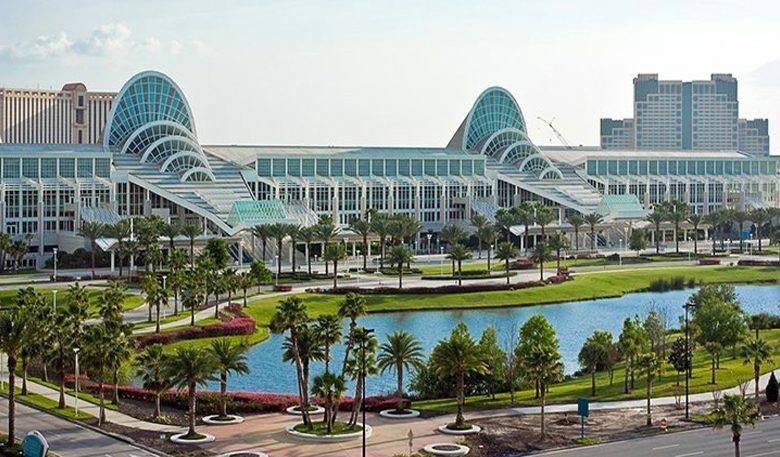 This year’s trade show had 569 exhibitors and 13,600 attendees hosted in the 250,000 sq ft convention hall. The hall was a sea of technology, impressive machinery and industry products. It was also a hub of like-minded people with vast greenkeeping knowledge. This was ideal for networking with fellow attendees and sharing stories about day to day life on the job. 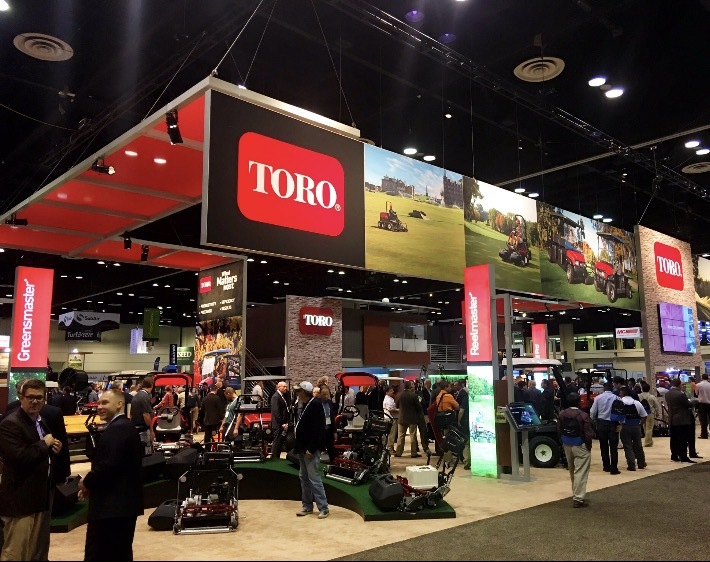 The majority of our time was spent with one of our long-time equipment suppliers and now official partner of the Links, Toro. This gave us the opportunity to discuss ideas and ask questions with their engineers regarding individual machines as well as being given demonstrations on some of their new equipment. This included the new Toro ‘GeoLink™ Precision Spray System’, which will be used on the surfaces at the Links in early spring. This uses a GPS touch screen system that is attached to a Toro Multi Pro® Sprayer that receives location data from multiple satellites. Its main feature is the single nozzle level control which is the system’s ability to automatically turn individual nozzles on and off based on the machine’s exact location and boundaries that have been set. 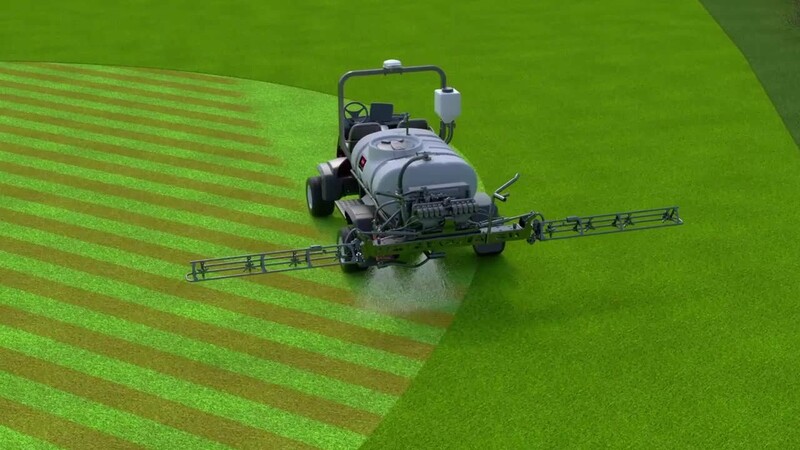 This delivers a very accurate and consistent application, eliminating over spray which benefits the environment and also minimises spraying costs. 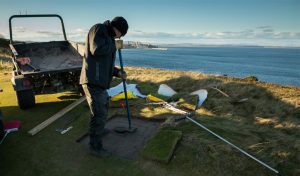 Attending the show also gave me the opportunity to meet new people and catch up with old colleagues including past St Andrews Links seasonal staff, some of whom have progressed to become course managers and even course directors of highly-respected clubs. 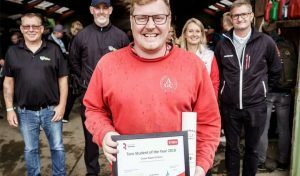 Learning how valuable their experience at the Links was and how much it contributed to their progression in the industry was particularly inspiring. Overall it was a very motivating, rewarding week learning so many new skills and ideas. I feel lucky to have met and conversed with so many experienced people from this ever-evolving industry. It has been a highly valuable experience and I now look forward to sharing what I’ve learned and implementing my new skills here at the Links.